Once wells have been added to a project (see Importing Wells), they can be loaded into a session. Click the blue "+" icon and select Load Wells already in the project. The Add Wells to Session window will load. 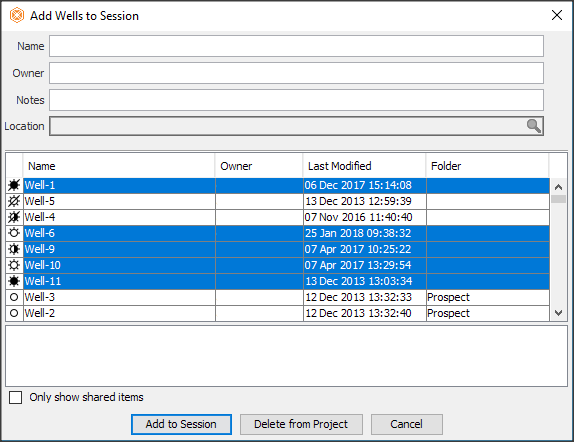 Note: Well(s) already in the session will not appear in the Add Wells to Session list. Select a well or multiple wells to be added. CTRL + A: select all wells. CTRL + left mouse button: select multiple individual wells. Shift + left mouse button: select a range of wells. Use special character "%" to simplify and/or filter the search result. Select wells by Location (using a polygon or a probe). To only show wells that are owned by you, or marked as shared, select the Only show shared items (see Multi-user Considerations). Selected well(s) will be added in the Well tab in the Control Panel. Note: In older projects, Insight may require compacting the database before the Location can be used (see Compact Project Database).